Turner’s Vineyard Motel & Function Centre – accommodation set amongst the magnificent rolling countryside of the Central Tablelands in one of the fastest grape growing regions west of the Blue Mountains. Conferences, weddings, parties or any special occasion or event can be catered for in our conveniently located function and conference centre. 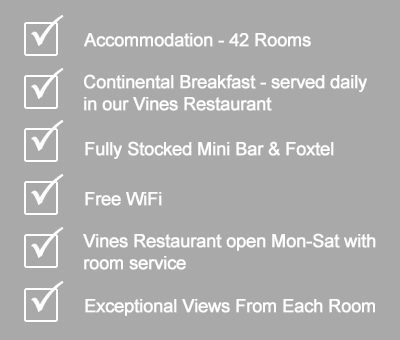 The Vines Restaurant is a fully licensed restaurant open Monday-Saturday for your convenience. Turner’s Vineyard is set amongst the magnificent rolling countryside of the Central Tablelands in one of the fastest grape growing regions west of the Blue Mountains. A scenic three and a half hour drive from Sydney, we are situated on the eastern outskirts of Orange, on the Sydney Road, which ensures peace and tranquility, yet only a few minutes drive from the central business district. Our conference complex is located on the hill adjacent to the motel. Boasting two conference rooms; The Shiraz and Chardonnay Rooms ensures that we are offering a comprehensive, stylish and practical function venue to impress and be enjoyed by many of our clientele. Our professional staff will set all function rooms to your specifications. Inspections of our facilities are always welcome.